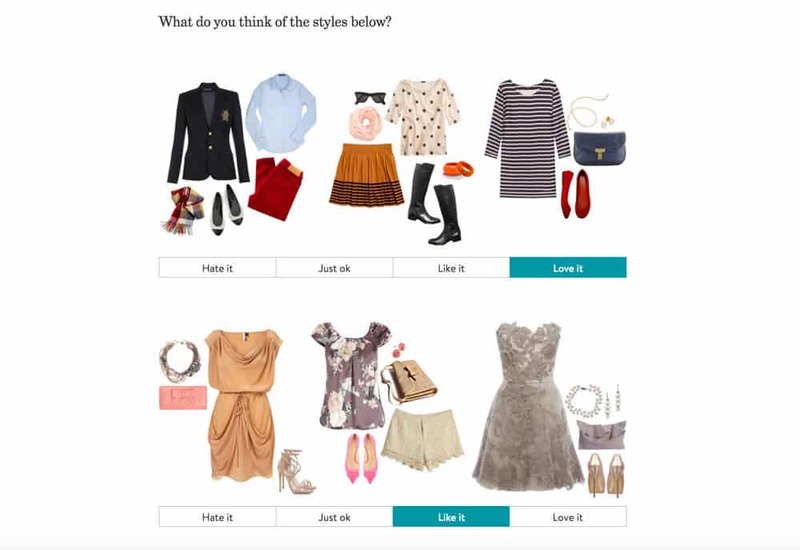 I’ve been talking about trying out the Stitch Fix experience for a while now. As much as I love shopping, I have the hardest time picking stuff out for myself. 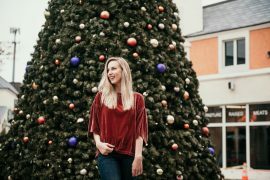 I always want someone else to shop for me, and I’m always texting or snapchatting my friends photos asking, “Should I get this, or this?” Stitch Fix is the perfect solution to that, so honestly I don’t know what took me so long to sign up. So far I’m pretty pleased with the outcome. If you’re on the fence, or just want to know more about the process…well, I imagine that’s why you’re reading this post right now. [[SCROLL FOR PHOTOS]] This post contains affiliate links, meaning I get a commission if you make a purchase using one of my links, but my opinions are entirely my own! 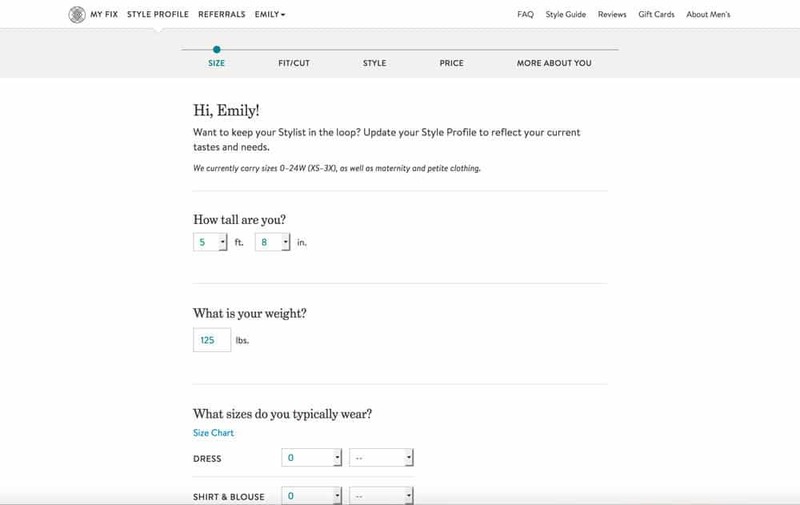 The process starts out by signing up for an account and filling out the “style quiz” which makes up your “Style Profile.” It goes pretty in depth, from asking your height, weight, body type, and clothing size (for each type of clothing) to how you like clothes to fit and what style you like based on photos they show you. They even give you the option to send them your Pinterest board, Instagram, and Twitter. I made a special Pinterest board for them and it really worked out! I could tell they looked at it by what they sent me. Another part of the process that is really great is that you get to pick your price point for different types of clothing and accessories. Also, if you don’t want something (like shoes, outerwear, dresses, etc) then you can tell them. You can even tell them what colors to avoid. At the end you have the option to put in your own customized notes. For instance, you can tell them if your job is casual so you don’t need a lot of business wear, or that you’d like to see more tops than bottoms. Once you are done filling out your Style Profile, it’s time to schedule your Fix. You can choose to get the box just one time or automatically schedule at the rate you want. The options are every 2-3 weeks, monthly, every other month, or every 3 months. I chose to do just one at a time. I’ve got to have a little self control! After your fix is scheduled you can add in a note for that specific fix. I like to use that opportunity to tell my stylist about any events or trips coming up that I would like to have clothes specifically for. You can even edit this as well as your Style Profile as many times as you want, but keep in mind eventually they’re going to have to finalize your box and send it to you. You can always update it for your next fix! For my first box, I told my stylist I had a wedding in July in Raleigh that was slightly casual so I needed a cute dress that wasn’t too fancy and that I was going to keep me as cool as possible in the North Carolina heat. I ended up with 4 gorgeous dresses and an adorable clutch that matched them all. Well…I caved and kept the entire box. Even though I knew right away which dress I was going to wear for the wedding, I wanted to keep them all for other occasions (or even just work). For my second box, I requested some rompers, shorts, and cute summer tops. I was a little disappointed when the note in my box said they didn’t have any rompers in stock in my size, but I was happy to see some other great summer options. After getting my second box, I noticed a couple of things: 1) You get the same stylist each time, which is nice because you only have one person “learning” you and your style, and 2) they actually look at your Pinterest board! I had a lot of navy scalloped and tropical/palm tree prints pinned, and I got at least one of each of those in this box. 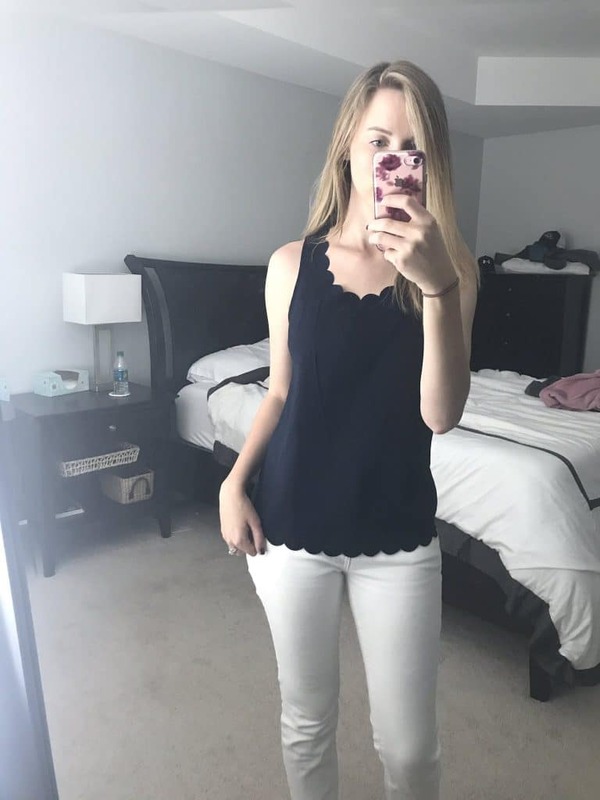 One of which I kept, my navy scalloped top (see below). The other I sent back because it was a maxi skirt with not a ton of shape to it. While I LOVED the pattern, I don’t wear maxi skirts that often. However, if it was on a dress, I would have kept it in a heartbeat. I only kept 2 pieces from my second box. The other piece I kept is a casual summer geometric tank. The pair of shorts they sent I really did love, but they were a little pricey for me. Honestly, I can be a little cheap, but I also don’t want to pay more than $50 for a pair of shorts that I can only wear on the weekends because I’m not going to wear shorts at work. I don’t think that makes me cheap, but to each their own, right? 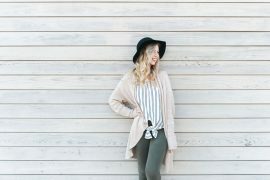 All in all, I think everyone should try the Stitch Fix experience once or twice. If it’s kind of a miss the first time, try giving extra feedback and trying again at least one more time. All the stylist needs is your honest thoughts. Did I mention the styling fee is only $20 and that goes toward your purchase? You are bound to find one thing in each box that you like that you can put that $20 toward! If you are ready to dive in and order your first fix, use this link (or the link below) to start filling out your style profile. 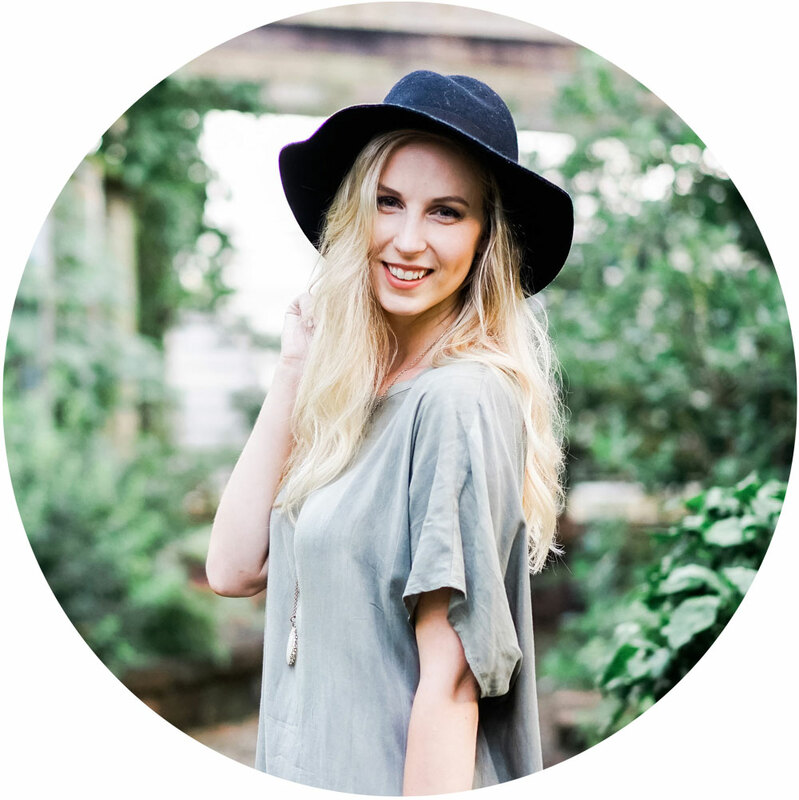 After you schedule your first fix, you get a link to send to your friends so you can get $25 toward your next fix! 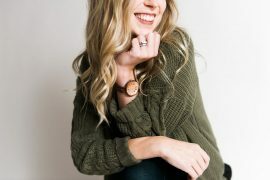 Show me your favorite pieces from your Stitch Fix experience by posting them in the comments here or tagging me on Instagram. I love seeing what everyone gets! 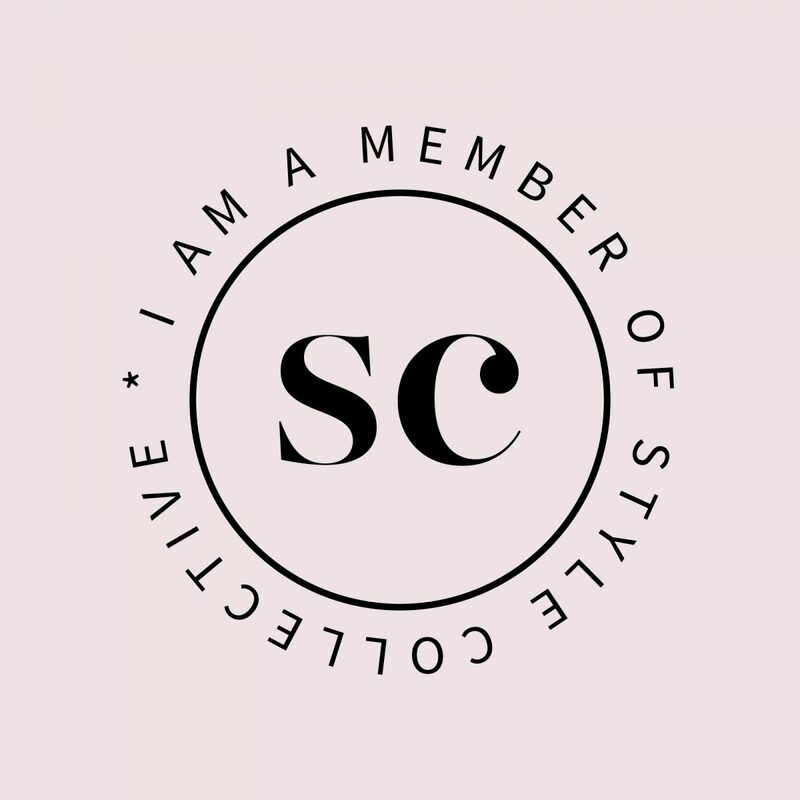 Have you tried a different “personal styling” box? Tell me about it! I want to try them all! 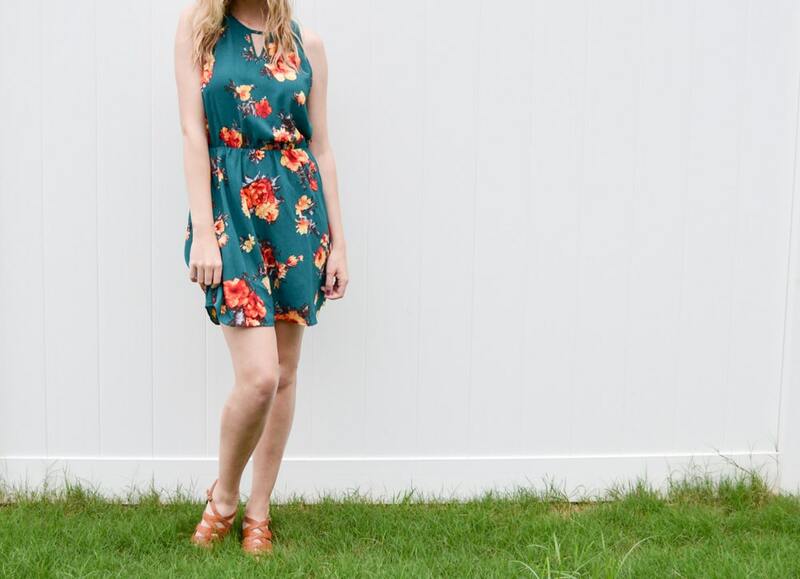 Great post about the stitch fix experience! I always want to try it out. Go for it! It’s definitely worth a shot for everyone! Just signed up!! Love this idea! I’m so excited to hear that! Tag me on Instagram @sandystilettos and show me your favorite pieces! !